IN THE MIX WITH HK™: IGGY AZALEA JUMPS FROM CLEANING HOUSES TO CLEANING UP THE CHARTS! IGGY AZALEA JUMPS FROM CLEANING HOUSES TO CLEANING UP THE CHARTS! 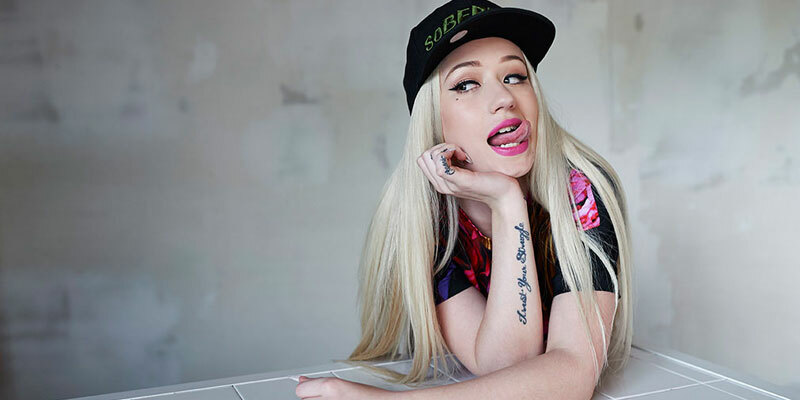 Not that long ago Iggy Azalea was a high school dropout who was cleaning houses full time. Now she is dropping dope raps and spittin’ sick rhymes in the male-dominated world of hip-hop. Iggy is EVERYWHERE Preforming on the Billboard Music Awards, on every talk show known to man and the most mainstream show of all time: Dancing With The Stars. Just last week Forbes did a piece on her titled Hip Hop Is Run By A White, Blond Australian Women. Well… there are a LOT of talented women in Hip Hop, one of whom is Nicki Minaj, whose third studio album, incidentally, is set to drop the end of this year. I can’t wait for that one! Anyway...a-ppar-ent-ly Miss Minaj had a few choice words for Forbes saying : "All Forbes needs to worry about is my finances and when I'm going to be selling Myx Fusions for $250 million". And Nicki wasn’t the only one not lovin’ that headline. Surprise!!! Forbes changed the title to: Hip Hop’s Unlikely New Star: A White, Blonde, Australian Woman. This unlikely new star owns the #2 & 3 spot on Billboard’s Hot 100 with Iggy’s own Fancy featuring Charli XCX and Ariana Grande’s Problem which features her Iggyness. I’m getting ready to re-invent both of those tracks with HK remixes that are no Problem and wicked Fancy! I’ll also be stirring up the beats on Jason Derulo – Talk Dirty, American Authors – Best Day Of My Life, Rixton – Me And My Broken Heart, DJ Snake & Lil Jon – Turn Down For What and much much more! Tune in this weekend coast to coast and worldwide and don’t turn it down for nothing. It’s an In The Mix With HK™ holiday weekend you don’t want to miss! WHAT TURNS MUSIC INTO GOLD? NEW MUSIC, REMIXES AND CONTEST WINNERS!